admin	 January 19, 2018 You Rock! I LOVE this case study from Sandra! If you are childminder or work from home it is a MUST READ! How would you describe your working situation? I work 7:30-5:30 Monday to Friday as a childminder. On top of my working hours, I also have a fair bit of paperwork to do – accounts, risk assessments, journals to keep track of children’s learning, daily diaries, planning, reports etc. There’s more to it than playing in the park with the kids that’s for sure! Tell us about your typical day? Up at 6am to shower and get ready (wiping over the bathroom after my shower). I clean and tidy the playroom as soon as I finish work the night before (this only takes 5 minutes as the kids are a whizz at tidying – I train them well!) so I just do a quick once-over of my lounge and kitchen/diner and vac/mop the wooden floors (another 5 minutes). Level one jobs done by 7am. Then half an hour to prep dinner for the slow cooker and a quick breakfast before 7:30am. It’s a bit manic but I’ve got into a good routine and it makes my evenings so much easier! BE YOUR FUTURE BEST FRIEND! After work, minimal prep is needed for dinner so I get straight on to my level 2 jobs for the day. If it’s a kitchen day I’ve tended to do most of it as I clean up after the children. By 6-6:15pm I’ve finished cleaning, prepped the food and ready to relax. How do you fit TOMM in? I wonder now how I ever managed before! It’s just about fitting it in with you and your life. If I’m going upstairs to the loo I might take my cloth and spray and wipe the bannister for example. Anything to make life easier. I find that by making that 30 minutes a priority it gives me a cleaner house and more free time, as my cleaning is focused and kept on top of. My mind is able to relax more as I don’t have the guilt of watching TV or reading a book when I feel I should be cleaning. A tidy house… a tidy mind! I’ve developed a rota for my paperwork too whereby I spend 1 hour a week, over a 4 week rota, doing a different aspect of my work paperwork. In exactly the same way as the TOMM it’s meant that everything is covered in a focused way and so I keep on top of it all and never feel like I’m being swamped or getting behind. The ripple effect of being more organised at work and having a much more organised home has been meant we have been getting more organised with our finances too! We set ourselves a weekly budget and try to stick to it. Since putting that in place we’ve had money left each week. We would’ve ordinarily gone way over that amount had we not been more focused and deliberate in our spending. We’re going to have a monthly date night with the amount we have spare each month. Bonus! What has been the most challenging thing about finding time for TOMM? There are days when it doesn’t get done. Life gets in the way. And sometimes I’m just plain knackered! I’ve found letting go of the guilt one of the most challenging things but I’m getting better. 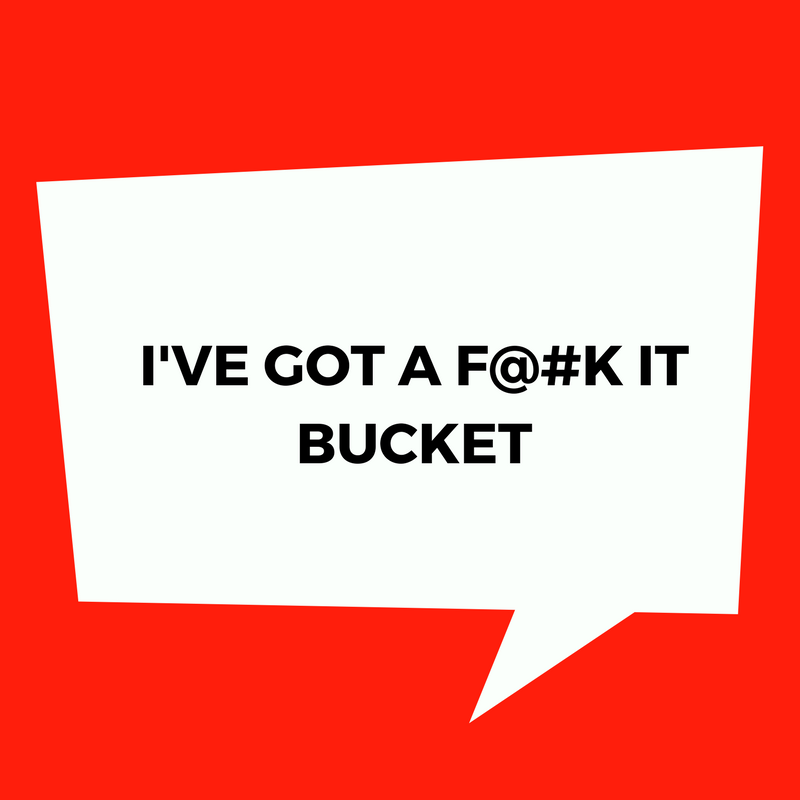 I have a mental ‘f*#k it bucket’ that I’ve started using – life doesn’t end if my skirting boards don’t get dusted! The other thing I’ve found challenging is getting the rest of the house on board. I have an amazing husband who washes, irons, cooks, washes up, does the shopping etc etc (I DO know how lucky I am, although it pees me right off that women should feel lucky when their other halves pull their weight!!!). My two sons are a whole new ball game. I’ve still to come up with a solution to their total lack of hygiene and their untidiness, but as long as it’s confined to their rooms I’m having to learn to live with it – for now! What top tips do you have for others who are new to TOMM? I think it seems daunting at first and the temptation is to spend longer than the 30 minutes doing your jobs which defeats the object. Once you’re in a routine the 30 minutes is genuinely enough. Trust in it – it works! What doesn’t get done can be your priority the week after and the more and more you do it the jobs get easier and easier. Also don’t confuse clean with tidy. Your house is there to be lived in and that means, especially if you have young children (or adult children it seems) it is not always going to be tidy … but it can be clean! Engage children as much as possible. I look after a child who is only just one and she knows exactly where all the toys live! More than anything else don’t give yourself a hard time! Guilt takes up too much time – stick that in the f@*k it bucket too! Previous Post Find Time To TOMM When Your Life is CRAZY BUSY!